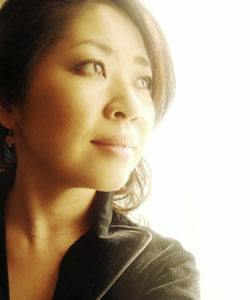 Pianist Junko Watanabe, a native Yokohama (Japan), has appeared in solo and chamber music recitals across the Europe and in Japan. She studied at the Senzoku University of Music (Japan), Imola International piano academy (Italy) and Piano Master course of Sesto Fiorentino (Italy). She also furthered her studies with Maestro Sakiko Nagayo, Leonid Margarius and Andrea Lucchesini. Music,Special Prize Mozart at the Concorso Internazionale “Tolmezzo”, First Prize (Gold Medal) and Special Prize “Memorial Art Center ” (July and public) at the Tokyo Art Center Memorial Piano Competition(Japan), in 2010 recipient “Award of the year 2009” at the Japan Art Center and obtained many other competitions. Among other honors, Mrs.Watanabe was selected in special master classes by Dietrich Fisher-Diescau at in Acqua Sparta (Italy) and Stuttgart (Germany) for Compositions pieces of Hugo Wolf. She playing soloist with the Chamber Orchestra “G.Petrassi”, Philharmonic Orchestra of Turg-Mures, Philharmonic Orchestra of Satu-Mare “Dinu Lipatti”, Chamber Orchestra of Chiba etc. with Concerts of Piano and orchestra: Beethoven, Chopin, Schumann, Liszt, Saint-Saens, Turina, Rachmaninov and Tchaikovsky. She assisted in pianist collaborative in Accademia di Perfezionamento del Teatro alla Scala (2004) and the Conservatorio Giuseppe Verdi inTurin – classe of violin at Maestro Paola Tumeo and playing Duo violin-piano with Paola Tumeo.